Keith and Kristyn Getty pictured with Dr. Adam Wright and Dr. Gary Cook. DALLAS—Dallas Baptist University recently hosted Keith and Kristyn Getty, as a part of the Institute for Global Engagement’s Leadership Lecture Series. They are modern-day hymn writers whose work covers the genres of traditional, classical, folk, and contemporary music. In addition to writing hymns, Keith and Kristyn travel worldwide sharing their music. The day began in Pilgrim Chapel as Keith shared his story with the students. In a panel discussion with Jay Harley, Vice President for Student Affairs, and Dr. Bob Brooks, Dean of the Graduate School of Ministry, he explained the purpose of the Gettys’ musical career before leading those gathered in a few songs of worship. 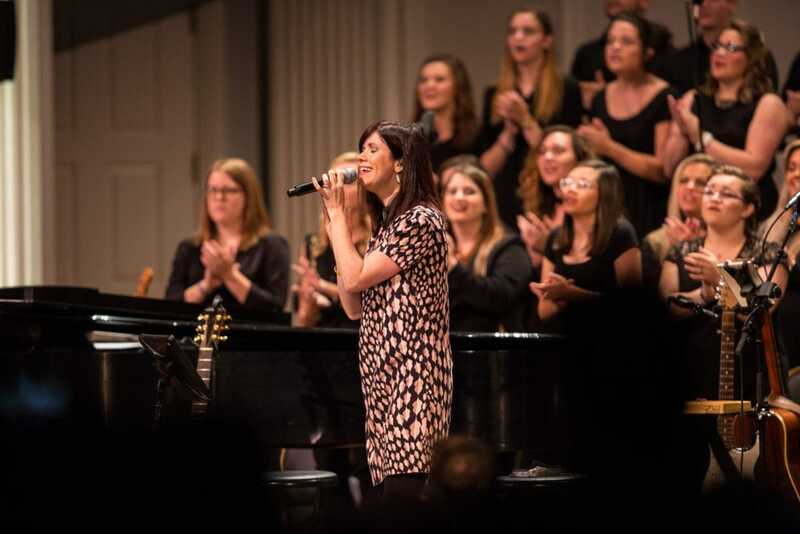 Kristyn Getty sings along with students from Dallas Baptist University. 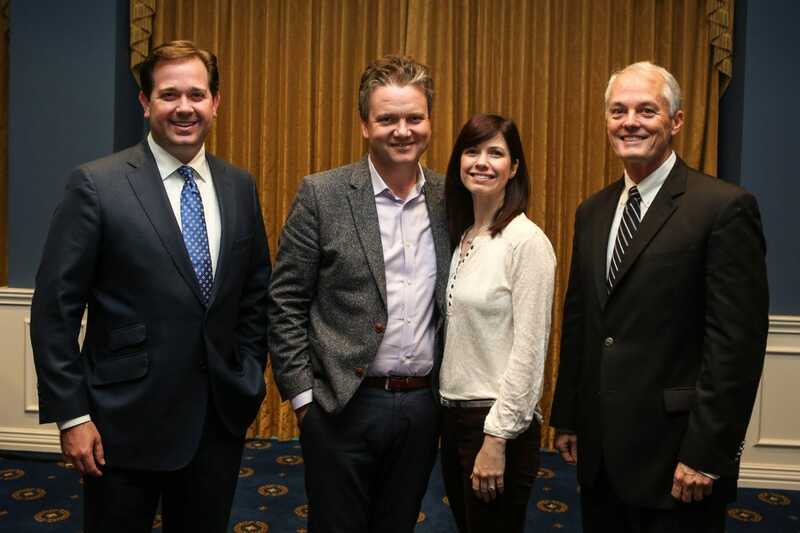 Following chapel, the Gettys joined the DBU faculty and staff for a luncheon in which the group worshiped together, shared a meal, and heard from Keith and Kristyn Getty about their ministry and song writing process. Dr. Adam Wright, DBU President, also shared with the group regarding his desire to invite the Gettys to campus, noting the incredible way that the Lord orchestrated the event. After lunch, Keith gathered with local worship leaders as a part of the Worship Leadership Summit. The Summit functioned as an opportunity for worship leaders and students to hear from Keith and other speakers, including Dr. Bryan Carter, pastor of Concord Church, Dr. Brent Taylor, pastor of First Baptist Church Carrollton, and Dr. Jeff Warren, pastor of Park Cities Baptist Church. The group also heard from Jim Denison, President and Co-Founder of the Denison Forum on Truth and Culture and Senior Fellow of the Institute for Global Engagement. A panel discussion followed, exploring pastoral leadership and worship leader dynamics. The day concluded with a sold-out concert that proved to be an incredible worship experience. Established in the summer of 2014, the Institute for Global Engagement is a joint-effort between DBU’s Gary Cook School of Leadership and the Denison Forum on Truth and Culture.